This couple’s intimate destination wedding turned out to be a three-day party! Anupama’s Tinder match showed up on the same evening she had a writing assignment due in law school. Despite the impending submission, she went out to meet Raghu and we’re not sure if she scored the marks, but score a husband she did. 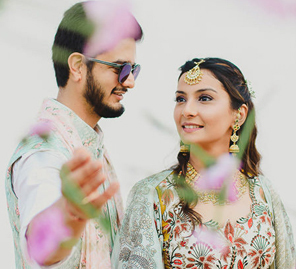 The duo got married recently and had WeddingSutra Favorite House On The Clouds film the revelries in a beautiful video, while Rimi Sen Photography documented the wedding through a storytelling series of photos. The excited bride shares with us their love story and the highlights of their wedding. “I was in law school in Berkeley and we met on the night I had to turn in my final writing submission. Safe to say, I didn’t do justice to the assignment. Raghu came to Berkeley and waited for me for an hour. When I got there, he surprised me with mom-made-biryani (read: bribe). I was so impressed with the courage levels, to be honest – it was only the first date and he wore pink pants and brought biryani? (Like what?)”. “We got married at Gokarna Forest Resort, Kathmandu. While looking for wedding venues we panned across the globe –Thailand, Bali, Sri Lanka – you know the drill. My parents are big on golf so they visited Gokarna for my mother’s 50th birthday. They loved it and couldn’t stop raving about the food and hospitality. I am so glad we went with Gokarna. The venues were stunning and the hotel truly bent over backwards and did everything in their capacity to make the wedding amazing. Nepal is truly such a beautiful place and the people are incredibly kind, hospitable and generous. 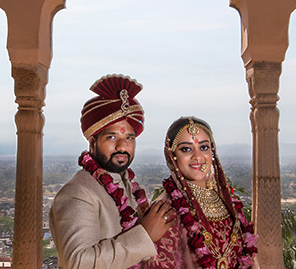 “Our wedding planners were Aliya and Vishal from Wedding Duo. They’re a team from Delhi we worked with remotely over FaceTime and WhatsApp calls. They were receptive to our ideas and did go the final mile in putting in the midnight hours to take the ideas to execution. 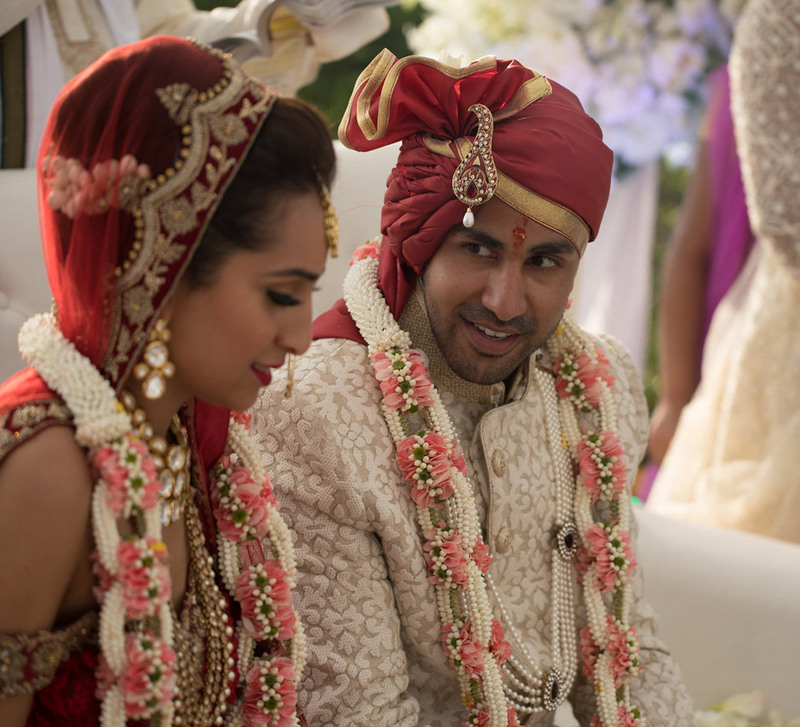 Rimi and Naman photographed our wedding and I think I can write an essay about how much I love Rimi! Rimi flew to San Francisco and did a 5-day pre-wedding shoot with us. The shoot was full of missed sunrises and sunsets and she slept in the living room in our tiny home. She became a delightful friend and that translated into amazing photographs. She also had Naman join us for the wedding. Naman is such a fantastic, down to earth and happy person to be around. I have to say that this was the best decision I ever made – well second best after Raghu. I will always be at a loss for words to describe how wonderful House on the Clouds, our videographers were. If you have the opportunity to have your wedding shot by them, PLEASE DO THAT. I spent most of my Sangeet dancing and chilling with this crew – they’re amazing and I can vouch for that! We did something non-traditional - we created our own website and mobile application and used that for all our communications. Raghu and I purchased software and then DIY-ed the entire project. We had guests from all over the world and we’re not big on paper. Thankfully, everyone loved it and we have something beautiful to hang on to forever. With the help of dear friends, we also made a drunk save the date video (inspired by drunk history) where we drank for 5 hours and created a time-lapse video to remind everyone to RSVP – it was super fun and intimate and made everyone laugh! Live, Love, Dance took care of the choreography. Aanchal is a GODDESS! My mom and dad loved her so much that we flew her down to Kathmandu and had her with us throughout the wedding. She put in crazy hours and was kind, patient, understanding and a riot to be around. She did a flash mob, conceptualized entries for every event and truly made the sangeet her own. We will forever be grateful to her for giving us so much love and unconditional support. “We began with a Coachella themed pool party. We wanted to bring some California dreaming to the wedding so we conceptualized a pastel, gold palette with pineapple elements. I can’t even begin to explain the effort that went into this event! Raghu and I sourced most of the décor from the States and had 10 suitcases flown into Kathmandu via family and friends. It was undoubtedly a smash hit – everyone let their hair down and the DJ really made the event super fun. “Next was a movie under the stars. We had a teepee and fairy lights set up and we watched a Bollywood movie with popcorn and chuski stations. We brought in a little bit of a mela vibe to it because this was the mehndi night. “The event started with the pellikuthuru function that we mixed with a Holi party so everyone could be involved in the color plus water balloon madness. We had Lennon sunglasses, genda garlands, and really cool performers. The whole event had the 70’s Hare Rama Hare Krishna Bollywood vibe. Immediately after, we had a paintball tournament set up in the woods that everyone seemed to have a blast at! The sangeet had a Sufi theme. We had an amazing Sufi band, a mashaal entry and we gave out cool nawabi hats and paasas. Aanchal made the event a smashing hit with some surprise performances too. Everyone – literally every single person went on the stage! 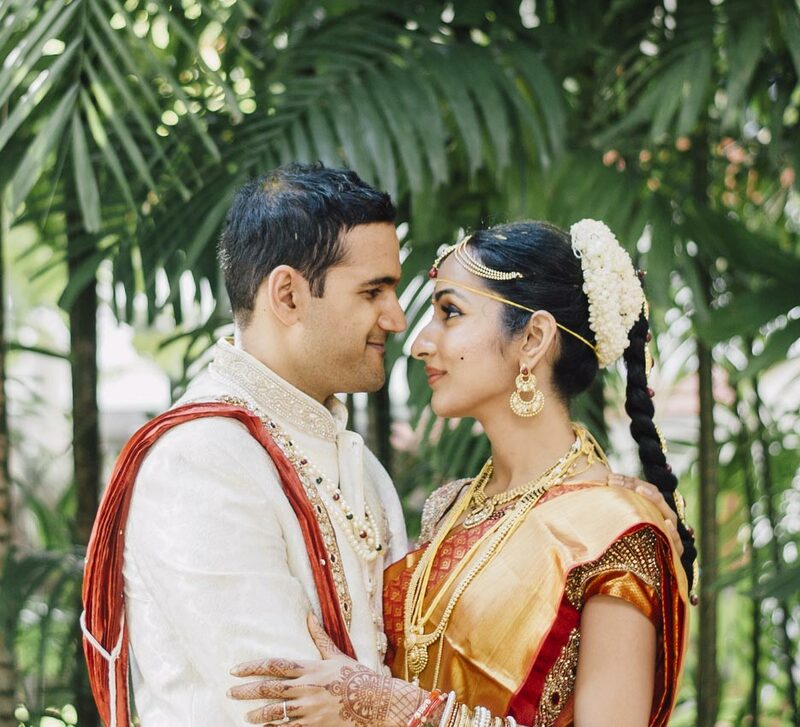 “We had a beautiful, pastel-themed Telugu wedding with all the traditions we liked. I wore a lehenga, my bridesmaids carried mirrored Jaipuri parasols, we had pre-recorded vows, my sister and her team stole shoes and bullied Raghu; in fact, Nick (Raghu’s best man) swears that he was assaulted while trying to save the shoes! It was truly so beautiful! We had beers, a flutist, raffia fans, and a bubble send off. Ashlesha did our makeup. By “our” I mean she did mine, my mom’s and my sister’s. It’s a funny story how I found her. She did my trial literally one day after she got married (she was still in wedding clothes and her house was all decorated). She is such a lovely, warm person and truly went the last mile with me. My best friend told me to pick my artist carefully because I would spend all my time with her. I’m so glad I listened to her because Ashlesha was such a pleasure to be around and it doesn’t hurt that she’s gorgeous! While I did wear a few real jewellery pieces, most of my ornaments were costume. Minerali in Bandra had almost everything. Stylish, statement pieces and I’m not too traditional so their collection was absolutely perfect for me. They made my bridal set happen last minute with a smile on their faces. Great team, great stuff. I can’t thank them enough for making my looks happen!" “I think a wedding is a representation of who you are as a person and what brings you joy. You need to figure what that is and then stay firm on making that happen. Raghu and I truly consider our friends to be family. We wanted to have a three-day party and we made that happen. I’ll also say that this whole process was a DIY for us. If you look at wedding planning as a team-building exercise, where you truly do the whole thing on your own, you will become better partners in life.